Brisa Rojas and Joshua Linares at the first PB idea collection event, March 3, 2015. With the support of East Side Union High School District Superintendent Chris Funk, and Principal Vito Chiala, Overfelt High School is making history and sending an important message to every district in the state – that students and parents must be engaged in decision-making if we really want to improve our schools. 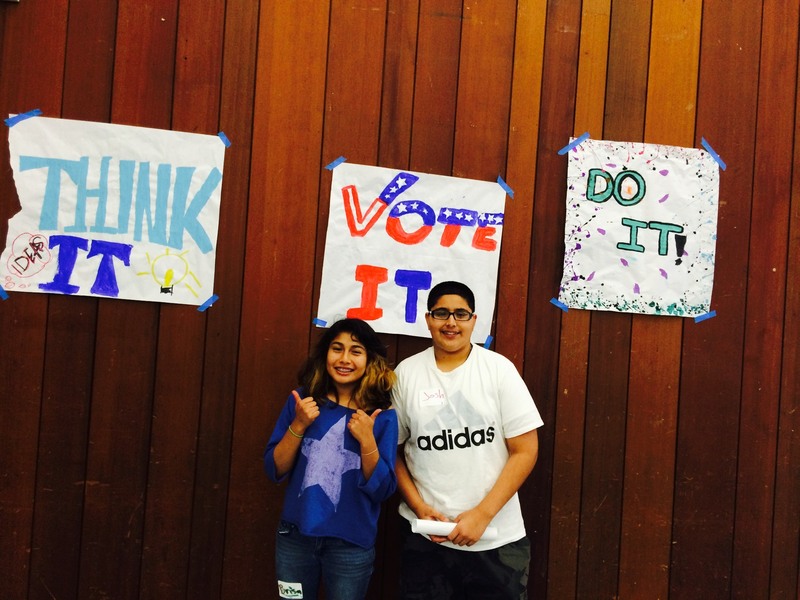 2015 marks the first year that a California High School will implement a truly democratic budgeting process called Participatory Budgeting. PB has been implemented in cities throughout the nation, but this will be the first school based process in the state of California, and the largest school based process in the United States. Through this process, members of a community or school control a portion of a city or school budget, and decide through idea collection and voting how the money will be used. CFJ staff and students learned about Participatory Budgeting from the Participatory Budgeting Project – a group spreading this innovative idea in cities and schools across the country. 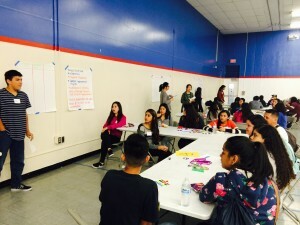 CFJ San Jose youth shared this innovative idea as a best model for the East Side Union High School District to engage parents and students in the LCFF process. After holding a “My Voice Matters Townhall” where CFJ held a mock process for the community, and meeting with Superintendent Chris Funk and several school board members, the district agreed to pilot this innovative idea at one school with the intention of spreading it to other schools in the district in future years. The pri ncipal at Overfelt High school – Mr. Vito Chiala – has long been a champion of student engagement and of shifting the perceptions the community has of Overfelt High School and the students there. 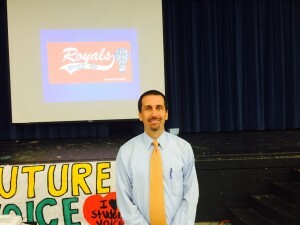 He agreed to work with CFJ on this pilot, dedicating $50,000 of the school’s budget to the process. This year Overfelt will become the first school in the state of California to pilot a promising budgeting model called Participatory Budgeting. Through this model, students, parents and Overfelt staff will decide how to spend $50,000 through a democratic decision-making process – the Royals Rise Up Community Project. All school stakeholders will be involved in this process, though the excitement has been overwhelmingly around how transformative this will be for students who are finally being heard and getting the chance to speak up about what they need at their school. We are currently in the final stages of idea collection! In April, students, parents, and school staff will vote on the projects and programs they would like to fund. We are excited to share out the results of the process. Looking forward, we hope that this process helps to shift the perceptions of youth in the community to a view of them as valuable contributors to finding solutions for their school, and creating a culture in which students are taking leadership in their own education. Learn more about Participatory Budgeting from our partners: The Participatory Budgeting Project. Learn More About the Royals Rise Up Plan.